My Mom and I will see an extremely old cemetery and we’ll stop at just to look at the dates on the tombstones. We will read the dates, look at how many family members are there, how long the children lived etc. I remember one family in particular. 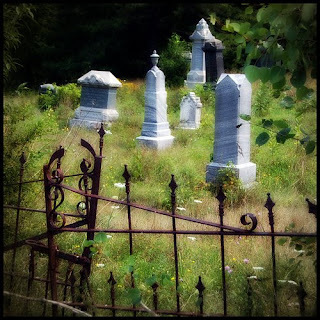 There were 6 or 7 small tombstones – obviously children, so I went to investigate further. This Mother had given birth to several children and none of them made it past the age of 3 or so. I looked at her dates and she wasn’t that old at all. I wondered if she died of heart break, especially since all of her children died so young. I wondered if she was ever able to overcome her pain of not being able to raise her children, see them go off to school or do many of the things the children in the neighborhood were able to do. I wondered if her husband was able to console her and help her through this horrible valley in her life, and then my mind drifts back to my own world and what am I doing to make my “dash” more meaningful. Can I inspire others to make a difference where they are? Can I motivate and encourage my children to be givers without having them be taken advantage of? Can an average young lady, such as myself, have a “dash” that is full of love, joy, excitement, passion and the heart to bring it all together to make a difference? Yes, and so can you. What are you filling your “dash” with? What will others remember most about you? If you are thinking about this (and I hope you are) and are not thrilled with what is in your mind, take some time to set some goals and make some changes. Yes – your dash is very important. I hope you are taking the time to fill it with wonderful memories, meaningful relationships and new friendships. My dash is a mix of spreading joy, love, abundance, peace, beauty and well being with everyone and everything. As the same time as I am sharing I would like to continue learning and enjoying from my teachers – like you. As stated by Max De Jong about our purpose here: THEN Said our purpose is To Learn. To Enjoy. To Share. So I made that my motto. @David – thank you! I love the quote about our purpose – that is awesome! You get it! You enjoy giving and know the benefits of it. Thank you for the encouraging comments! I'm glad you enjoyed the article. Very nice post, Marie. And yes, it does make one think about what he/she is doing to make life meaningful. I often struggle with this. I’ve always been overwhelmed by the idea that only a life lived large makes a difference…but being a quiet homebody I just don’t live that way. AS I grow older I’m realizing more and more it’s the little moments in life that matter: the hug of a friend in pain, the support of someone as they follow their dream, making someone laugh. You have made such a difference in my life you’ll never know. I appreciate the support and kindness. Your dash definitely has changed people’s lives. @Melanie – thank you for your kind comments. I’m constantly reminding others that the little things do matter and make a difference – yet “secretly” I struggle with wanting to do huge things for others. I can’t wait until SJC can make grants to others doing great works, I can’t wait to supply 3,000 book bags filled with supplies – I can’t wait to give out several thousand toys at Christmas Time. Thanks for allowing me to make a difference in your corner of the world.